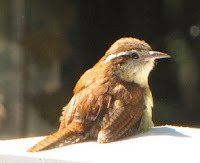 Birds - We've got more new baby birds, but I'm still enjoying the little wrens the most. So precious and sweet and innocent. They seem to want to grow up fast compared to the finches that want to be beak-fed by the parents seemingly forever. 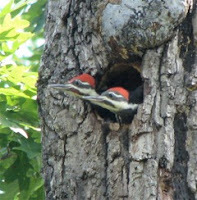 I've seen Pileated Woodpeckers, Black-capped Chickadee and Rufous-sided Towhees. Last year was the first juvenile towhees I had seen here on our property, although we've had the Rufous-sided Towhee pretty much since we arrived here in 2000. I also hear a lot of baby cries from nesting areas. When they get almost ready to fledge they get real excited when the parents return to the nest with food and you can hear that excitement. I don't bother the area where I hear these sounds since humans can create plenty of trouble. It's a lot of work for the parents to feed their growing young and they don't need humans interfering. Leave them alone and enjoy them when you see them fledge. 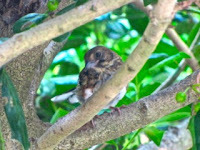 Fledging is the stage in a young bird's life when the feathers and wing muscles are sufficiently developed for flight, although still dependent on parents for feeding and instruction. House Finch - The House Finch was introduced to our eastern area from the western side of the United States. Unlike some introductions, it received a warmer reception due to the red coloring on head and breast and the long, twittering song that is so cheerful. It can now be heard in most places on the continent. We enjoy having a lot of them here at Bluebird Cove. You may be familiar with the House Finch Eye Disease that has been in bird news for years. I won't share photos of ones we've taken to The Wildlife Center to be relieved of their plight. They can only euthanize the bird since even if they cleared the condition in a bird, it will still be infectious to other birds. We used to see some that were infected every year, but it's been two years now that I haven't seen any at all so I thought the situation was getting better, but the most recent news about this disease is quite shocking and disappointing. Researching this subject, I found much more discouraging news. "More than half the bird species we tested have been exposed to the bacteria responsible for House Finch eye disease," says André Dhondt at the Cornell Lab of Ornithology. A paper recently published in the online scientific journal PLOS ONE shows that a bacterial parasite previously thought to infect only a few species of feeder birds is actually infecting a surprisingly wide range of species, though most do not show signs of illness. Species testing positive for exposure to the bacteria include feeder favorites such as Black-capped Chickadees, Tufted Titmice, and American Goldfinches. But exposure was also detected in forest species, such as the Wood Thrush. "That was another surprise," says Dhondt. "How on earth do Wood Thrushes get infected with mycoplasma? They're not a feeder bird at all. "The organism could mutate into a form that is much more virulent among other bird species and create a new epidemic," noted Dhondt, who added that "while we know that many species of songbirds are exposed to Mycoplasma gallisepticum, we still do not know whether the bacteria in other species of songbirds are identical to that living in House Finches in the same area." Read the whole story in Science Daily. Greater Sage-Grouse - A bird we never see here in the eastern United States is the Greater Sage-Grouse. For most of the year the Greater Sage-Grouse (Centrocercus urophasianus) are inconspicuous, browsing on sagebrush and other plants at ground level. This western United States bird is most known for its mating season. Read more about this bird. From March to May, males gather in groups, called leks, to compete for females. They perform elaborate strutting displays by ruffling feathers and making a distinctive noise produced by air sacks in the chest. Females gather to evaluate the males and choose which ones to mate with. 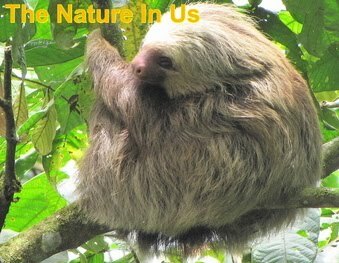 View the PBS video on this "nature event." Tidbit - This intrigued me to know whether or not it was true, so I searched to verify the info and found it was fact. Critters - Deer and Fawn - I noticed that Mama Love Deer was pregnant back in May and then one day she arrived with the baby. She was right out from the walkway to our front door and cleaning the baby. The little one was quite patient but after awhile it was wanting to nurse. 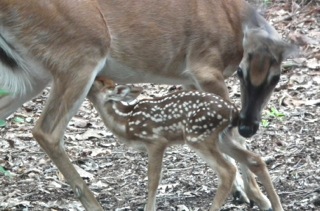 View Video on Fawn Bath Time. Reminds me of myself many times. God is wanting to clean me up and I've got different ideas on my mind. He sees a way to bring me more abundant living and I have my own trail map of "want to do" that will never provide the joy, prosperity or peace that my Creator Father has planned for me. "Therefore, I urge you, brothers and sisters, in view of God’s mercy, to offer your bodies as a living sacrifice, holy and pleasing to God—this is your true and proper worship. Do not conform to the pattern of this world, but be transformed by the renewing of your mind. Then you will be able to test and approve what God’s will is—his good, pleasing and perfect will." Does that mean God wants to make us His slaves? Of course not. He made our hearts and minds and knows what will really bring us all the blessings we could ever imagine. The way the world operates has nothing to offer compared to what the Kingdom within us holds in store. I've been writing about this crippled deer since 2012. 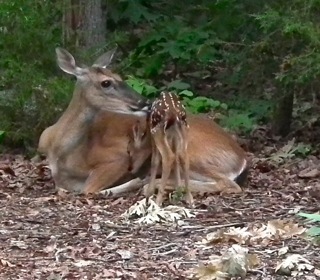 When she brought a young fawn behind her last year, we changed her name to Mama Love Deer. It was a name given in faith since she didn't seem to love that fawn in any way. She was always ahead of it and would walk away when it tried to nurse. At one point the fawn was drinking from our small pond and slipped in. It's a concrete pond with sloped sides so it got back out, but Mama's response only 15 feet away was to look up and then go back to eating some wild blueberries. They kept coming around and the fawn did okay. Renaming Mama in faith has paid off. She's been very attentive to this one, like night and day. It's wonderful to be able to see things like this but then it is also sad to see the down side of things like her right front leg having the knee joint not bending forward but bending outward to her side. She's held up to the other female deer. At times some have been friendly, but mostly they have chased her away. She now comes at a time apart from others so she has less running to do. It's sweet to know that she considers our yard a safe place. Grizzly Bear - My friend, Charlene, in Northern California, has a lovely tract of land that's been passed down in the family. They call it The Homestead. She's got a lot of family and it's always amazing to me how often they all gather at the place. They work to keep it nice for them and the wildlife and have built a variety of things to increase all the fun they have when they get together there. Not long ago they put up a webcam to see what was coming around at night. They specifically wanted to see bear .... and it was too long before they did. But this recent photo that they got is just so precious! 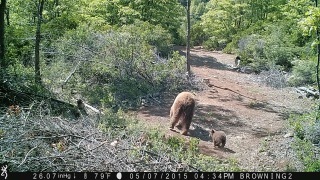 That wee tiny little cub alongside of the mom. What a portrayal of the wild lives being aided by their stewardship of this land. They've had a wide variety of wild animals at night and I'm blessed to get to share in the photos .... and now I'm sharing this one with you. When we do the seemingly unimportant things in the Kingdom ... such as maintaining a piece of land ... it becomes a big thing to the animals that God created to live on this earth with us. What a blessing Charlene and her family are. We shall not know all of the "God things" we've done while on Earth. When we get to heaven we may be shocked to find that much of what we thought was "good" was not really "God." Many times we like to do things where we will receive our rewards on earth. It's human nature. Serving behind the scenes where nobody knows about it is a test of our pride. I don't always fare too well on that "look at." Travel - Yellowstone National Park - It's summer and families are planning vacations across the United States and around the world. So many beautiful places to see and experience. It makes it difficult to imagine how amazing Heaven will be when this is just a little drop of God's creativity. 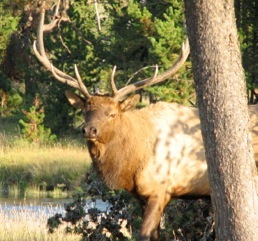 While we were at a Nature's Sunshine Convention in Utah years back, we planned a follow-up a trip to Yellowstone National Park and Grand Teton National Park. We flew our son in from Oklahoma and had the experience as a family. Pictures definitely don't do justice, but if you can't make it there in person .... enjoy the views and animals from my travel gallery. Yellowstone is a wonderland of magical things. It's America's first national park. Old Faithful geyser is well known and the majority of the world's geysers are preserved at Yellowstone. They're actually the reason the park was established in 1872. A mountain wild land of extremes is how it feels. It's home to herds of bison, moose and elk, grizzly bears, wolves, and so much more. This park is the core of one of the last, nearly intact, natural ecosystems in the Earth’s temperate zone. Its lands cover three states: ID, WY and MT. Grand Teton National Park is known for its amazing landscape views. Mountains, valleys rivers, lakes, and amazing skies and cloud formations are home to forests and wildflower meadows and a long list of wildlife. The park also has a rich cultural history with old homesteads and cattle ranches. You can walk on a trail that American Indians might have used in the 1820s. It will be a breathtaking experience and an unforgettable vacation if you get here. 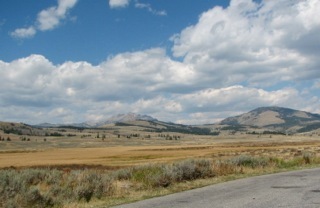 View Yellowstone and Grand Tetons National Park Album. Family - Battle For Our Children's Minds - (From AnswersInGenesis.org) Every generation has the same decision to make: Will I serve the God of the Bible or a false god? How long does it take to lose a culture, from a Christian perspective? Actually, it takes only one generation. The devil knows this, and of course God warns us about it. Adolf Hitler understood this when he said, “He alone, who owns the youth, gains the future!”Over and over again in Scripture, God instructs His people to make sure they train up the next generation (Prov. 22:6). Many fathers today are not carrying out their God-given, God-commanded role to be the spiritual head of their house and to take the responsibility for training their children in spiritual matters. In England, two-thirds of young people now say they don’t believe in God—in a culture where most people once went to church. In America, a major poll indicated that two-thirds of young people will leave the church once they live on their own. Even when parents pull their kids out of public school, the anti-God message is so prevalent in the media, museums, and colleges—and even among friends, neighbors, and workmates—that young people are woefully unprepared to understand and defend their beliefs. What a sad state of affairs? But there is always hope. Read the rest of the article and helpful ideas. Until next time ... meditate on this verse. Need help understanding what meditation is? Watch the June 2nd broadcast (2nd link on the series) on this series ... or watch the whole series. Zephaniah 3:17 - "For the LORD your God is living among you. He is a mighty savior. He will take delight in you with gladness. With his love, He will calm all your fears. He will rejoice over you with joyful songs."